Brownish-black to black and opaque, with white stripes. Black lace onyx may be dyed. 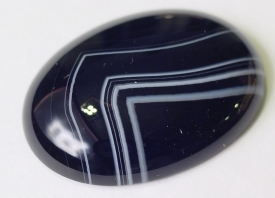 Black Lace Onyx is a member of the Onyx gemstone family. With bands of white translucent onyx. A Black, opaque with white stripes, good polish, good cut.